The $38 billion in spending cuts that the House of Representatives and Senate negotiated late last Friday, April 8, to fund government operations through the remainder of FY 2011 are spread over various programs, including public transportation and high-speed and intercity passenger rail. As Passenger Transport went to press, the Senate had just passed the FY 2011 legislation. The measure, which the House passed earlier in the day, now goes to President Obama for his signature. Congress recesses for two weeks today. Under the agreement, transit formula programs remain at FY 2010 levels of $8.34 billion. Funding for Capital Investment Grants (New Starts) is reduced by $400 million in FY 2011, for a total investment of $1.6 billion. The legislation also rescinds $280 million from FY 2010 New Starts funds. The budget deal eliminates FY 2011 funding for the high-speed rail program. The program was funded at $2.5 billion in FY 2010, but the bill also rescinds $400 million from FY 2010 funds. Under Department of Homeland Security appropriations, the Rail and Public Transportation Security Grant Program is reduced to $250 million, a $50 million cut from FY 2010. In a statement released April 12, APTA President William Millar said APTA and its members have "strong concerns" about the reductions in public transportation and high-speed rail investment. "Singling out the high-speed rail program by eliminating all FY 2011 dollars," he added, "is simply short-sighted. This is particularly troublesome when 32 states and the District of Columbia are advancing projects with FY 2010 dollars. High-speed and intercity passenger rail investment is a catalyst to create jobs and provide the foundation for our nation's growing economy." Reductions in public transportation investment for new projects could not come at a worse time, said Millar, as Americans are facing the rising cost of gasoline. "Now is the time we should be expanding our investment in public transportation infrastructure, not reducing it," he said. For more details, see APTA's Legislative Alert. The Government Accountability Office (GAO) released a new report this week on the Federal Railroad Administration's (FRA) project selection process and how it made its decisions. The report is titled "Recording Clearer Reasons for Awards Decisions Would Improve Otherwise Good Grantmaking Practices." In a statement, FRA said it is "extremely pleased that GAO’s review of the project selection process concluded that DOT followed good grant making practices in making high-speed rail award decisions. [FRA] worked hard to ensure that the program was both thorough in its evaluation of project merits and fair in its decision making. GAO was particularly complimentary of FRA's merit-based practices for identifying projects and awarding grants and considered FRA to be one of the top rated agencies in the government for communicating critical information on its American Recovery and Reinvestment Act competitive high-speed rail grant program." Here are just some highlights. At a ceremony April 14 in Washington, DC, APTA took part in the release of a new stamp featuring public transportation issued by the United States Postal Service. The Go Green commemorative stamp (Forever® priced at 44 cents) series has 16 designs. The Postal Service hopes to raise awareness of simple actions everyone can take to conserve natural resources and promote the health of our environment. Joining APTA at the First-Day-Issue ceremony was U.S. Environmental Protection Agency Administrator Lisa Jackson and other environmental and government leaders. The Go Green stamps are available online. 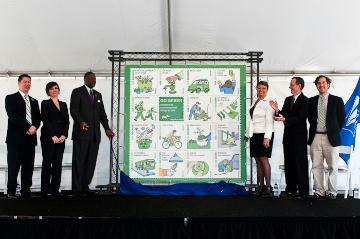 Presenting the new “Go Green” stamps are, from left: master of ceremonies Emil Dzuray, acting chief sustainability officer, U.S. Postal Service; Alexandra Pardo, academy director, Thurgood Marshall Academy Public Charter High School, site of the event; Ronald A. Stroman, deputy postmaster general; Lisa Jackson, administrator, Environmental Protection Agency; Patrick Pope, principal, Savoy Elementary School; and Sean Miller, director of education, Earth Day Network. The early fee deadline for APTA's Bus & Paratransit Conference is Friday, April 15! Plan to attend the General Session Monday, May 23 at 9:45 a.m. on "The Pursuit of Organizational Excellence: Changing Your Organization's Culture," featuring Matthew May. An internationally recognized expert on change, innovation, and design strategy, May helps organizations pursue effective solutions and strategies to be competitive in today’s global market. The Phoenix Valley Metro Notes program has won seven ADDY Awards for advertising. Its "How to Ride the Bus" and "How to Ride Light Rail" music videos won local gold spots for best online commercials and will go on to the national competition in June. A new study has suggested that smartphone apps may be the key to getting people out of their cars and onto public transit. 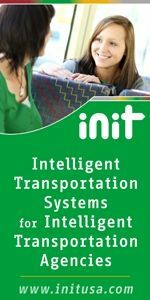 The study of commuters in Boston and San Francisco found people are more willing to ride the bus or train when they have the right tools to manage their commutes. The Atlantic examines an exurban office park in San Ramon, CA, where 33 percent of the 30,000 workers leave their cars at home and where the attitude among workers is that it is "cool" to have a bus pass. Salon interviews the author of a new book, "Helvetica and the New York City Subway System," which explores how the Helvetica typeface has transformed everything from New York's subways to corporations.